Threatened with defeat the first time this season, Real Madrid put on a remarkable late-game surge to finish off host Brose Baskets Bamberg 69-89 in the Game of the Week on Thursday and remain undefeated atop regular season Group B. 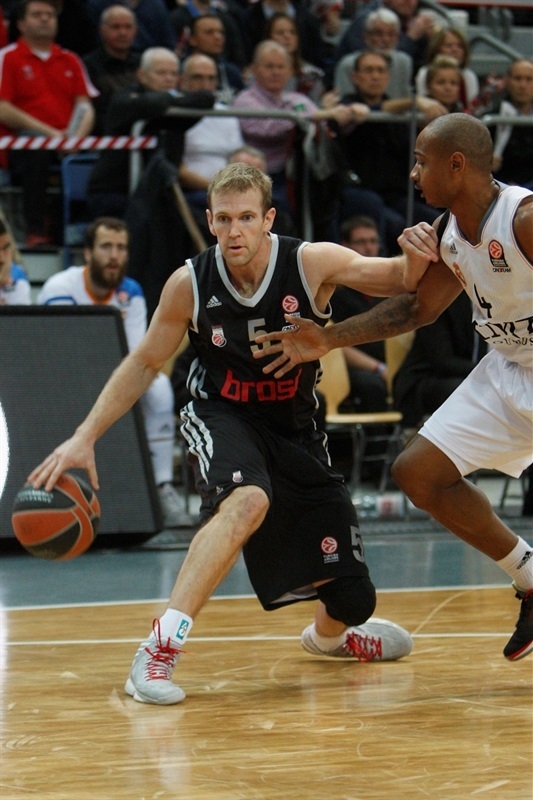 While Madrid approved to 7-0, all wins by 19 points or more, Bamberg fell to 2-5. Madrid led by 17 points in the third quarter, but Bamberg chipped away until a three-point play by Rakim Sanders made it 69-72 with 4:16 to play. From that point until the buzzer, Madrid rattled off 17 unanswered points, 12 of which Rudy Fernandez either scored or assisted on. 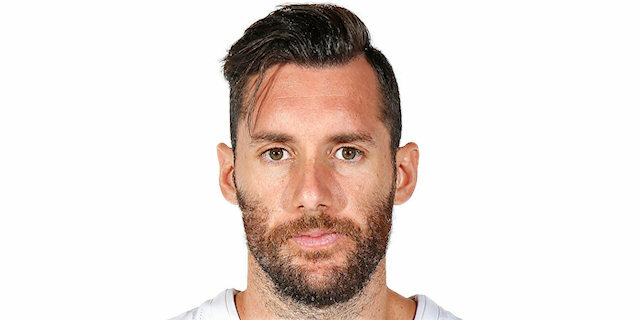 Nikola Mirotic made 4 of 5 three-pointers to lead Madrid with 20 points, while Sergio Rodriguez came off the bench for 19 more. Fernandez finished with 13 points, 8 assists and 4 steals. 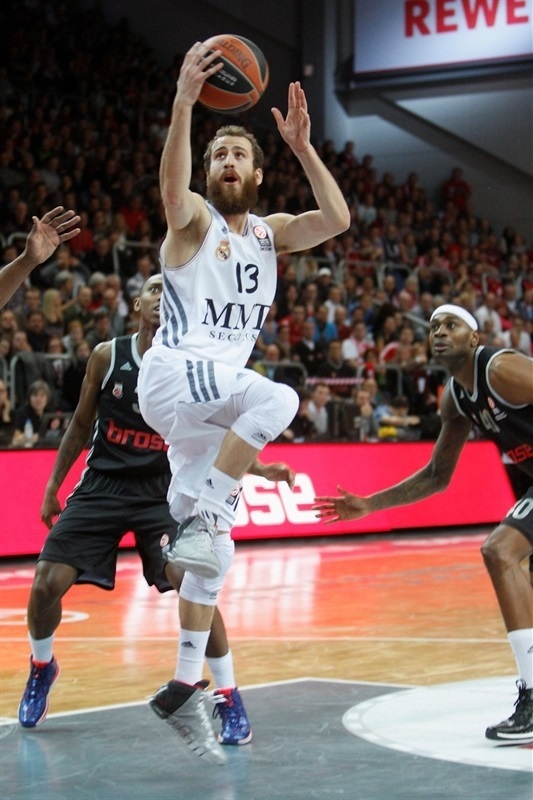 Madrid as a team hit 15 of 30 three-point shots, as compared to 6 of 22 for Bamberg, and 14 of 14 free throws. 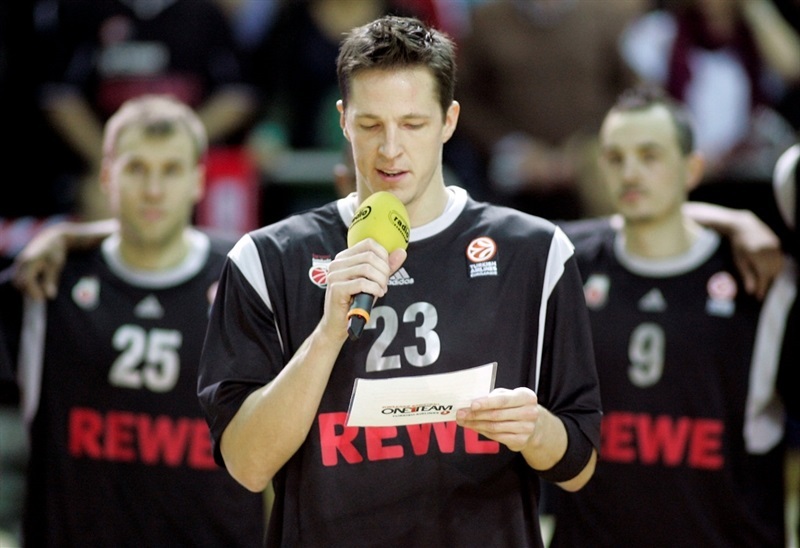 Bamberg was led by Sharrod Ford and Maik Zirbes, with 12 points each, while Gavel Anton added 11. 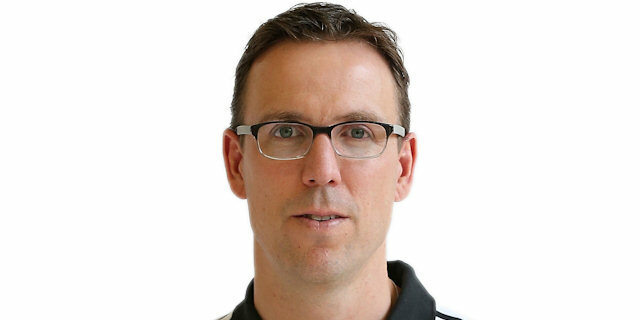 Bamberg coach Chris Fleming made three changes to his starting lineup with John Goldsberry, Casey Jacobsen and Novica Velickovic starting along with Anton Gavel and Maik Zirbes. Madrid coach Pablo Laso went with the same starting five of Sergio Llull, Tremmell Darden, Rudy Fernandez, Nikola Mirotic and Ioannis Bourousis. Both teams started trying to establish an inside game with Zirbes opening the game inside. Darden's jumper tied the game and Bourousis's dunk made it 2-4. Bamberg continued to get the ball inside to Zirbes and Velickovic before a backdoor layup from Gavel, who then nailed a three-pointer for an 11-4 lead. After a timeout, Gavel hit 2 free throws to extend the run to 11-0 and the advantage 13-4. 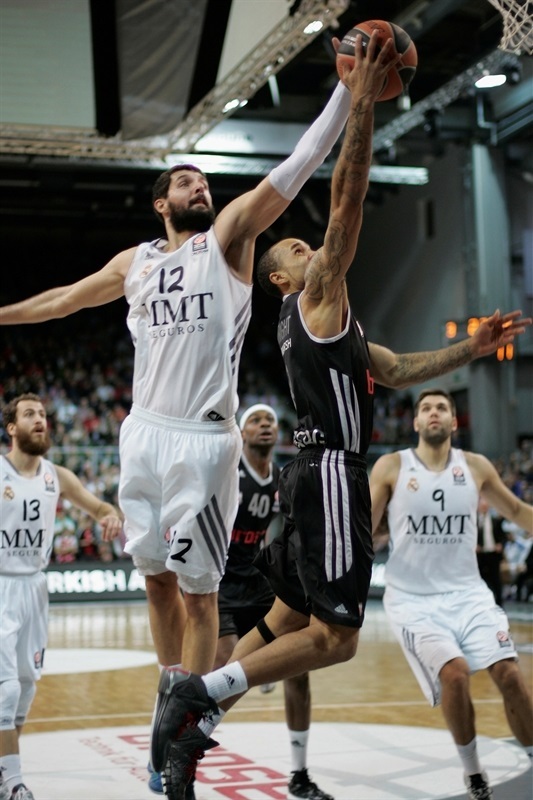 Mirotic ended a 4:19 minute scoring drought for Madrid with a three-pointer. Zirbes pushed the cushion to 15-7 before 4 straight points from Bourousis. Rodriguez added 2 free throws to make it a two-point game before Jacobsen knocked down a three-ball to push the Bamberg's advantage to 18-13. Mirotic hit another long ball to tie the game and Rodriguez's driving layup had Madrid up 18-20 before the score was knotted at 20-20 on Ford's dunk. 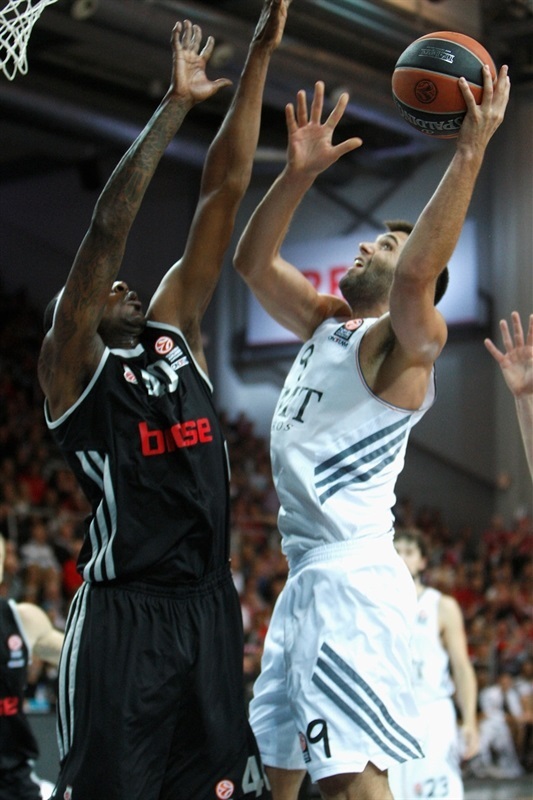 Rakim Sanders opened the second quarter with a free throw to give Bamberg the lead 21-20. 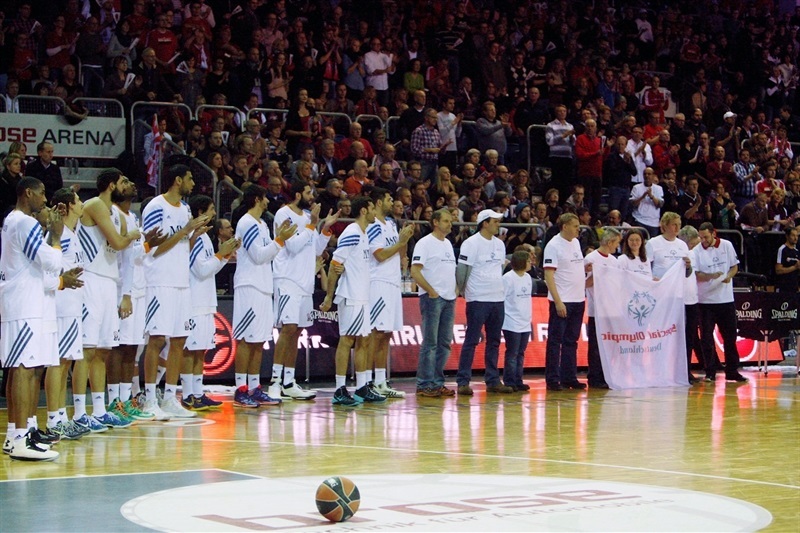 But Madrid punched Bamberg again with 8 quick points including three-pointers by Rodriguez and Fernandez for a 21-28 advantage. A Jaycee Carroll triple increased the margin to 23-31. Two baskets by Felipe Reyes kept the lead at 8 points before a Jamar Smith three-pointer and free throw cut the deficit to 31-35. Carroll buried another shot from the arc to push the cushion back to 32-40. Gavel hit a layup and Velickovic downed a hook to move Bamberg within 36-40, but Carroll again was on target from long range to keep Madrid in charge 38-43 at intermission. Llull opened the second half with 2 fouls shots before Zirbes sandwiched baskets around a Mirotic three-pointer to keep Bamberg within 42-48. Mirotic, however, put back an offensive rebound and then Fernandez nailed a three-pointer to increase the margin to 42-53, resulting in a Bamberg timeout. Gavel missed 2 free throws out of the timeout before Mirotic knocked down a fade-away jumper and Fernandez drove to the lane for a layup and a 42-57 advantage. The margin reached a high of 43-60 on Dontaye Draper's triple from the corner. Bamberg switched defense to a zone and Madrid failed to score in the final 4 minutes while Brose went on a 6-0 run to get within 49-60 after three quarters. Rodriguez came to Madrid's rescue with 5 straight points and Felipe Reyes re-established the visitors' double-digit lead at 56-67 before Bamberg charged again. Three-pointers by Smith and Sanders around a jumper by D'or Fischer suddenly had the hosts within 64-69. Rodriguez answered from downtown for Madrid, but Bamberg reacted with a dunk from Zirbes and a three-point play by Sanders to make it 69-72 and provoke a Madrid timeout with 4:16 to play. A scoreless minute passed before Fernandez hit 2 free throws then assisted Mirotic for a triple. Mirotic returned the favor as Fernandez struck from deep, then Mirotic and Draper added 4 points to make it 69-84. Fernandez found Draper in the corner for a triple and then, following his third steal in as many minutes, passed to Rodriguez for the game's final basket, having turned a three-point game into a 20-point win in under 4 minutes. "I think we played over long stretches pretty good basketball. A couple of times it got away from us. But especially in the end we came back with the zone. It was a three-point game with a little over three minutes to go. We had big chances to win but unfortunately we didn't execute out of that timeout. And it cost us the game. It is a step going in the right direction but obviously we still have some work to do to learn how to finish this kind of games." "Just as we expected, it was a very tough game. I want to congratulate my players for the victory. It was very tough from the beginning. We couldn't get a rhythm on offense. In the second quarter we were able to play better basketball. We corrected some mistakes and got a lead at halftime. In the third and fourth quarters we extended the lead. They changed the defense and we had problems getting offense. In the end we had the energy to get the win. In the end, 20 points is not really the correct score. I think Brose Baskes did a much better job. They should be happy about the game they played. We have a deep team and it was too much in the end." "They really picked it up in the end, but we also stopped playing defense. We showed that we can play with the best for 35 minutes. And Real Madrid is the best. But we do not need to be afraid of teams. And this game showed that." "They tried to change the tempo with the zone defense. We probably didn’t execute like we should offensively against the zone. But I think the last minutes we improved in defense. We stole a lot of balls and that’s why we won by 20."